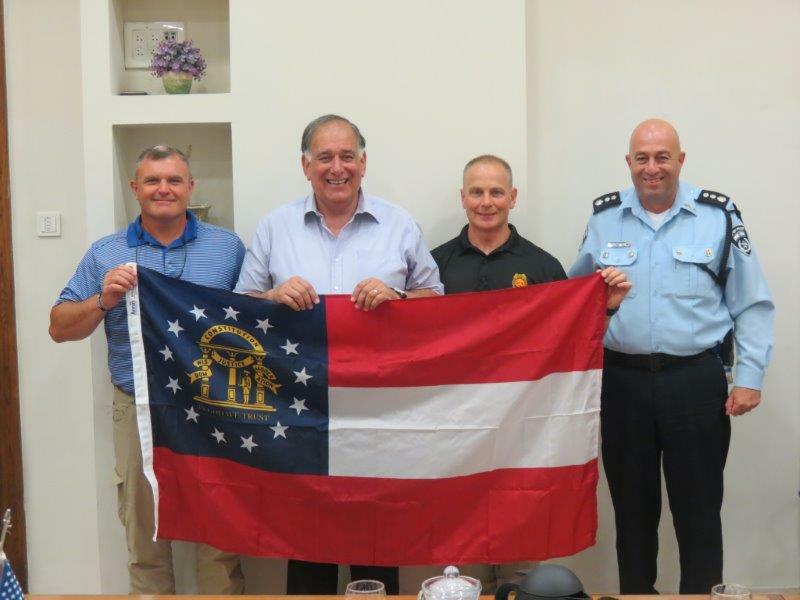 Above: Haifa Mayor Yona Yahav is flanked by Christopher Wigginton (left), the director of the Georgia Public Safety Training Center, and Georgia State Patrol Capt. Mark Hambert behind the Georgia flag. 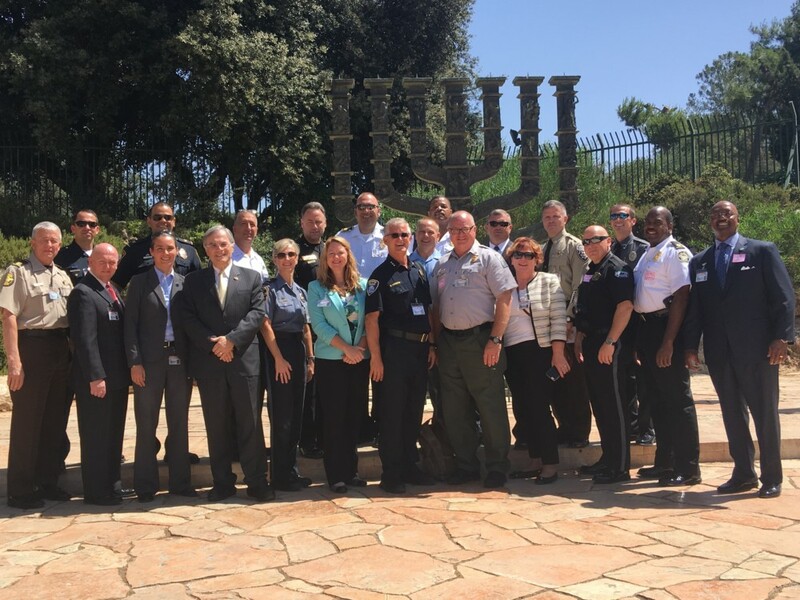 Police leaders, sheriff’s officers and a commissioner representing 11 Atlanta-area public safety and law enforcement agencies recently spent two weeks in Israel to train in the latest counterterrorism techniques and technologies with that nation’s top police professionals. Israeli traffic officers offer a demonstration to members of the GILEE delegation. Exchange. The involved local departments included the Cherokee County Sheriff’s Office, the Brookhaven Police Department and the Gwinnett County Police Department. The Georgia Bureau of Investigation also participated. 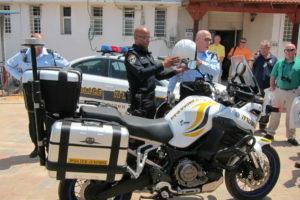 Non-Georgia participants came from the Tennessee Bureau of Investigation, New York’s Metropolitan Transportation Authority Police Department, and police departments in Alabama and Washington. GILEE hosts public safety exchanges, conferences and expert speakers to introduce best practices in law enforcement to police and other public and private safety professionals to enhance their capabilities to serve and protect citizens. Among other honors, GILEE received the Georgia Association of Chiefs of Police President’s Special Service Award in 2014. 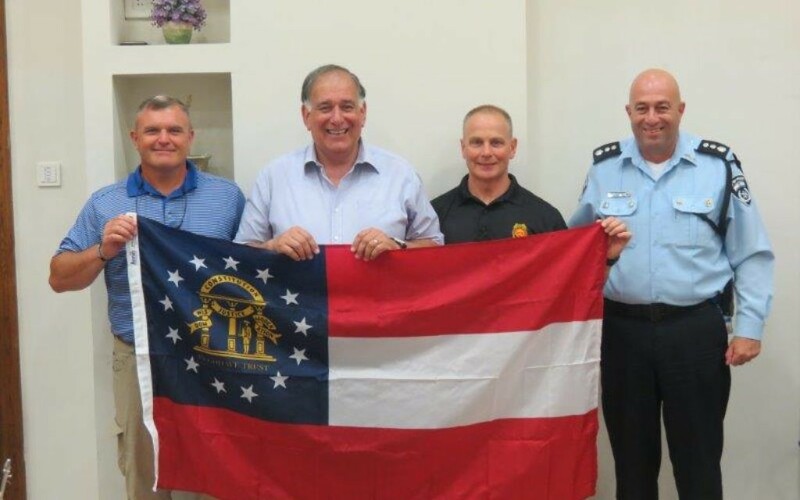 The Georgia International Law Enforcement Exchange recently sent 19 delegates from the Southeast to Israel for training. Here they pose at the Knesset. Since its founding, GILEE has graduated more than 1,350 public safety and law enforcement officials from more than 380 training exchange programs. About half those officials are from the United States, mostly from Georgia, but others come from around the world. In addition, more than 25,000 public and private safety leaders have attended GILEE’s special briefings, seminars and workshops.